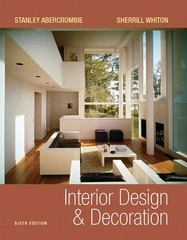 Interior Design and Decoration 6 Edition Addressing interior design and decoration from the ancients to the moderns, this text describes the dominant influences of fashion design and focuses on the close relationship between interior design and the architecture of our times. With the Sixth Edition of Interior Design and Decoration, Stanley Abercrombie continues the revival of this time-tested and well-respected text—first published in 1937—to make it meet the needs of today’s teachers and students. In his second revision of Sherrill Whiton’s classic text, Abercrombie presents the full history of interior design—during all periods and throughout all regions—in a manner that facilitates easy comparisons among different times, places, and styles.